The Greenwich Alternative Investments Macro Sentiment Indicators are based on the outlook of hedge fund managers employing a macro view and who manage, in aggregate, in excess of $30 billion in assets. The purpose of the indicators is to reveal how these managers believe the S&P 500, the U.S. Dollar and the U.S. Treasury 10-year Note will perform over the current month. There is an interesting trend in the results over the last three monthly surveys. The survey is released on the 2nd of the month and this month shows that those who use a macro view to run their hedge funds are in one camp or the other – nobody is neutral. The neutrals have tended to become more bullish, and a minority of those that were formerly neutral have become bearish. There have been two distinct phases in the rally to date. The first phase (March to end May then a month of consolidation) had a much steeper ascent than the second phase (early July to mid October). These have been two phases of a liquidity-fuelled rally from a massively oversold bear market low. The later stages of phase two were accompanies by some recovery in the real economy - 3Q GDP was up after all. Classically the real economy will continue to draw money from financial assets – the liquidity push and then cushion will be defused over time. The breadth and volume in equity markets reflect this gradual withdrawal of liquidity – there is less buying power evident now, and selling has more of an impact on prices. 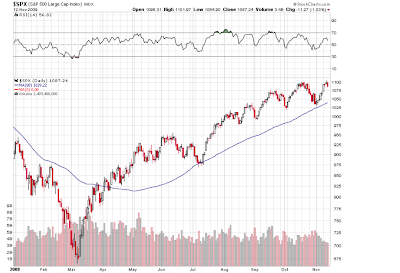 The declining momentum is picked up in the lower peaks of the (14-day) RSI on the top of the S&P chart below. A head and shoulders is a reversal pattern that takes place over a period measured in weeks or months. For my part I see a distribution taking place – less buying power accompanying the market going up this month – the volume has noticeably dropped as the markets climbed from the 80-day MAV. If a head and shoulders does emerge, many participants and commentators will be on it. The measured target for a H&S on the S&P is the 950 area – exactly where the first phase started to consolidate from in the first half of June, and a good support level. Whilst we see which camp becomes dominant on a multi-month basis, the waning buying power at work suggests that the bears will soon dominate, but there is not a clear sign that the bulls are out of it yet. 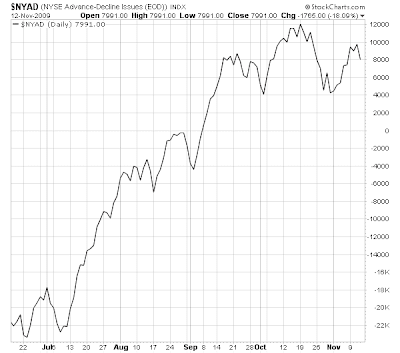 So we could see a minor new high on the S&P shortly. That would be an untrustworthy further rally given what has unfolded over the last month. The distribution referred to in these posts could be a trading range market for a while. It doesn’t have to be a dramatic fall to the bear market lows. After this year’s gains a visit to 950 on the S&P would be neat technically. But the consolidation of the gains could be a longer lasting sideways band – say 150 points trading up and down on the S&P lasting 6 months. There is more than one way to consolidate a rise, even a major liquidity-fuelled one.